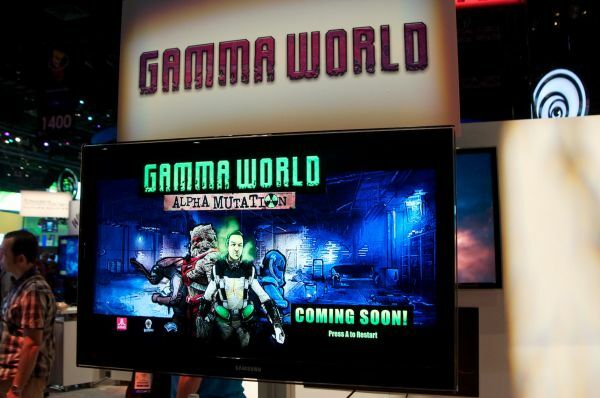 I've never heard of Gamma World: Alpha Mutation before my short demo with the game at the Atari booth at E3 2011. The game is based on the TSR table top game of the same name - both are set in a unique sci-fi / post-apocalyptic setting with zany characters. The story goes that an accident at the Large Hadron Collider in Geneva resulted in an apocalyptic event called The Big Mistake - obviously the series doesn't take itself too seriously. The game is being developed by Bedlam Games, who most recently came off the development of Dungeons and Dragons: Daggerdale. The demo began with an introduction to the character design. All the player characters are hybrids of different origins, and while you can choose your hybrid, every time you die your second origin shifts. So, for instance, our character started as a human-yeti hybrid. He has all the powers of each half, but if you die, you may inherit say...a cockroach instead of a yeti. There's an option to pay to keep your genetics in tact, since you've most likely invested into that skill tree - but it also helps mix things up a bit by shifting origins. There were four character origins being shown: Android, Yeti, Human, and Cockroach so you've got 12 possible character types. Gameplay wise the game controlled a bit more like a 3rd person shooter than a top down RPG, there were plenty of different guns to acquire, though melee combat does play a part in the game. The yeti-hybrid allowed some of these kind of skilled attacks as I watched the developer maul some police...police rabbits. These rabbits weren't the only over the top enemies as our human yeti also went hand to hand with some pig soldiers in an abandoned subway station. The game's visuals take on a graphic novel type feel, with hard outlines on characters and plenty of colors. It's pleasing to the eye, though, it may be a bit over done. The underlying systems of the game are at its core an RPG governed by die roles and XP. You'll be able to level up your character, unlock skills, and collect equipment like any decent RPG out there. On the co-op side of things the game will offer two player split-screen or four player online co-op. The game is set to release on Xbox Live Arcade, PSN and PC this fall as a downloadable titles and I was told there would be plenty of content to follow. Hopefully there will be more hybrid types to pick from as the full ruleset has over 20 origins to choose from. Page created in 1.0269 seconds.